The sweet name of Christ occurs three times in this first portion of Chapter LIII; this, in itself, demonstrates Saint Benedict’s profound attachment to Our Lord. Saint Benedict seeks the beloved face of Christ in every person, in every encounter, in all circumstances. Saint Benedict would have us show fitting honour to all. There is a liturgical quality to Benedictine hospitality; this is evident in the loving attention to the details of welcoming guests. The preparation of a guest room, clean, carefully furnished, complete with fresh linens, and with flowers, is as sacred a duty as the preparation of the altar and sacred vessels for the Holy Sacrifice of the Mass. In both instances, the eyes of faith are opened to a mysterious advent of Christ. Saint Benedict foresees, all the same, that the evil one may seek to infiltrate the monastery through the guesthouse, by making use of a guest’s weaknesses or vices, and by abusing of our hospitality. Every monastery has had experiences of troubled and troubling guests. We have to be clearsighted and prudent in welcoming guests lest we be taken in by the delusions of the devil. Against all such dangers, prayer is the most powerful safeguard. The guestmaster will inform the abbot without delay of any guest whose behaviour risks becoming a threat to the peace and good order of the guesthouse and of the monastery. With experience, the guestmaster becomes capable of identifying potential problems and of dealing with them firmly, gently, and prudently. 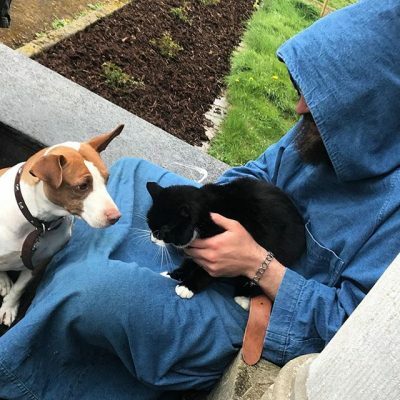 Saint Benedict places prayer together before all else, not merely to unmask the delusions of the devil, but also to bring a guest straightaway to the One whom he seeks in coming to the monastery. Today, more than ever, guests come to the monastery in search of Christ. How healing and comforting it is for one to arrive at a monastery and find there a space and a community in which Christ is to preferred to all else: Christ sought; Christ believed; Christ loved; Christ adored. For this reason, we invite our guests to enter into the silence of our life, and into the rhythm of our liturgical prayer. In the refectory, guests profit from the liturgical ethos of our meals and from the reading. Some guests will benefit also from a certain participation in work, especially in the fair season. A characteristic and particular grace of our monastery is the exposition and adoration of the Most Blessed Sacrament. Guests have spoken to me of the irradiating presence of the Most Blessed Sacrament that they experience here. I often pray Our Lord to diffuse the light of His Face in every part of the monastery and its land. For the priests who come to us, the opportunity to spend prolonged time before the Most Blessed Sacrament, with gratuity and free of interruption, is of inestimable value. Guests must also be given the opportunity for a certain amount of relaxation and social interaction and conversation, lest they feel overwhelmed by a silence to which they are not accustomed. Most guests, and in particular, our priest guests, whose lives are so often marked by loneliness, come to the monastery thirsting for prayer and desiring to be with Christ; they also come with a certain human need for some fraternal exchange. A few minutes of exchange after meals with the guestmaster and among themselves is sufficient to meet this need. 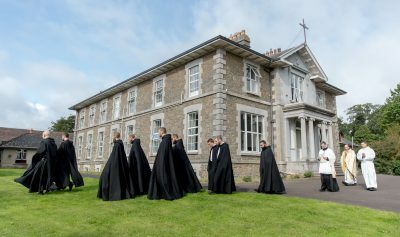 Exceptionally, and on special occasions, the abbot may invite guests to the community recreation, especially guests who are Oblates of the monastery. It has been our custom also to invite Oblates and men enquiring about our life to come to the daily Chapter in order to benefit from some teaching on the Holy Rule. The faithful carrying out of Chapter LIII depends largely on the guestmaster who, for this reason, bears a sacred responsibility. The guestmaster, like the cellarer and the other officers of the monastery, shares in the fatherhood of the abbot. He must look after the guests with a fatherly solicitude, while remaining discreet and prudent. Our Declarations and Statutes contain wise and clear indications on the welcome extended to guests and on the limits of our interaction with them.